$400. 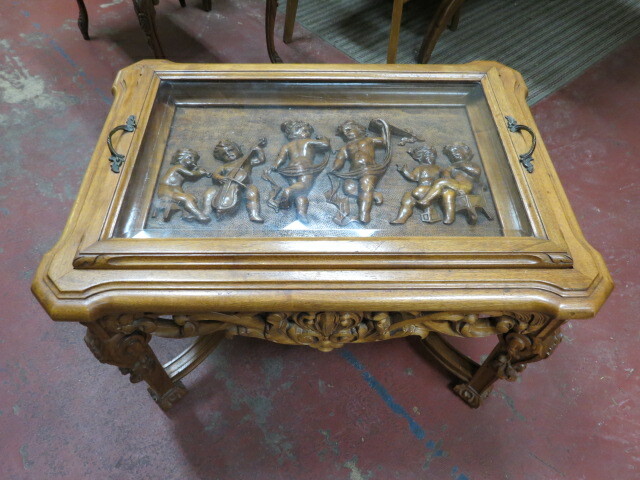 Vintage antique carved walnut tea table/coffee table. Rectangular center has amazing carved cherubs playing music, dancing and socializing. Lift off glass tray sits on top. Heavily carved pierced apron and square legs. Curved stretchers with carving in the center. An amazing piece! Perfect for your living room. Excellent condition. 28in wide, 20in deep, 19in tall.